I am thrilled that a panel of some of my favorite bloggers judged my Cowhide Dresser as one of the Top 6 entries in Not JUST A Housewife’s DIY Projects of 2011 contest. There were almost 800 entries, so I am pretty darn excited about that! Now readers vote on the Top 6 to decide who gets the Top Spot. I’d love it if you would go over and vote. 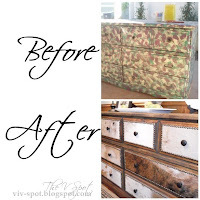 If you vote for my dresser, that would be awesome, but there are some Uh-Mazing transformations that I am up against. You can vote once a day, through Friday, January 13. Thanks! I have often been accused told that I am a strict mom. I am OK with that. People sometimes frown at me when they hear about some of the ways we parent our kids… but you know what? I am OK with that too. Only two of our four boys have accounts. They do not have them because they reached an arbitrary age requirement, but because we felt that they were mature enough/responsible enough to understand the basic principle that the internet is written in ink, not in pencil. If you have any worries about your kid’s discretion, don’t let them get an account. Even once the child is allowed to get an account, there are conditions. Our kids do not have any inherent right to privacy while they live under our roof. Condition #2 – I must know their password. This serves two purposes. It allows me to easily revoke their Facebook privileges. Once Devin lost them for an entire semester because he blew off a huge project in one of his classes and his grade in the class dropped to a D. I took away all privileges (not just fb) until he brought the grade up. (It was a HUGE project that he neglected) Anyhow, I did this by temporarily changing his password. I restored it to the original once he got his grade up. It allows me to know what’s really going on and who they’re hanging out with. When they signed up for the account, they understood and agreed to the fact that I will be doing “spot checks” on their Facebook accounts. I randomly have logged on under their accounts and checked out what they’re doing and saying and, more importantly, who their friends are and what they are doing and saying. Some of those kids are little Eddie Haskell’s. All nice and proper when a parent is around, but little trouble-making hellions when they’re not. I want to know that kind of thing. I have told the boys they can (and should) disclose that their Mean Mother snoops around their account on occasion and does look at their friends, their friends photos, and what they post. There is no right to privacy on the internet, especially on these social media sites. If it’s out there, it’s fair game. Don’t post anything that you wouldn’t want your mother to see. Simple. As a parent, it’s my job both to protect and to teach… sometimes simultaneously. What do you think? How do you monitor your kids’ Facebook activities? Or do you? Oh, I LOVE your Facebook policies!! I have a 3yo and a 16 month old, so we haven’t had to approach the whole Facebook for children thing yet, but I’m so keeping your ideas in mind, and will be implementing them for myself in a number of years’ time. I grew up with strict parents (they wanted to know where I was and who I was with all. the. time.) and I’m trying to raise my boys in the same spirit. You’re an inspiration to us newer mothers!! I have limited my kids to Twitter accounts as of yet…they BEGGED me for accounts for months and once I finally conceded and let them have an account, the novelty magically wore off…Fewwww. So far I have only had to tell my 6th grader “NO” a couple times for Facebook. Lord knows how adults act on it, I don’t need to see any more drama than necessary. Bravo for you! I wish other parents were this strict! BRAVO TO YOU! I agree with your FB policies and you are right to enforce them. Anything can be posted on the internet and it can have a huge impact on our lives. I have a 1 1/2 yr old so we have not approached this topic yet, but I will be keeping your rules in mind when the time comes. And good job sticking to your guns as a mom! We have the exact same policies … our daughter had been asking for facebook for quite a while. When she turned 14 we felt she was “mature” enough to have one, hoewver, she has to be friends with me and I have her password on my computer so that I can access her account at anytime. She is not allowed to put her hometown, school etc and I have taken off location services and tagging has to be approved etc. I also have her email account on my phone so that I can see what is going on. Strict I know but I heard a phsycologist say once that when it comes to the internet/facebook etc that you have every right to check/snope/have caution etc because it is there for the whole world to see – that it is very different to a private diary hidden under the mattress! You did/are doing great. We have rules on the commputer as well. My kids call me a “Meaner” and I am ok with that. If you are not a meaner at least sometimes then you are not a parent you are trying to be their friend and that never ends well. Be the parent.They have enough friends. You can be their friend after they turn 20. Way to be the parent V! I sometimes think that someone needs to be monitoring my facebook activity. I have the same policies. My kid doesn’t even know his own password, though. I will be modeling my parenting from you. I completely agree and do NOT feel like it’s a “violation of their privacy”. Good for you, Viv! Now I’m off to read yesterday’s post. We have the same policy on Facebook – my kids are required to tell me their passwords to FB AND email, in fact. It has been very helpful to know that I can “check in” on them any time, and luckily, they haven’t gotten involved in anything scandalous. . . yet. I like the part about actually revoking their privileges, though – I never thought of THAT. I could change their password until they change their attitude – YES! Amen and Ditto to all of it. I have the password to my daughter’s account, and I also monitor the status updates of her “friends”, after a formal dance, of course they all want to post their pictures, one of the girls that she barely knows put the title of her dance album, “Homecoming B***, rhymes with witch). Bye bye nasty girl. The only I can think when I see things like this, are where are their mothers?????? Who knows, maybe they are posting the same things too! Way better to be a bit strict and protect your kids than being afraid to “parent” them. That is what I see happening, such as, when did it become O.K. to talk back to your mother and get away with it? See it way too often. These parents are not doing their children any favors, if anything, they children are not being equipped with the thing called “self discipline” and respect for authority. I see major problems for these kids once they get in the “real world”, because it isn’t like Facebook! And that works until he figures out that he can also change his own password to minimize your snooping, delete controversial conversations, or that he can create more than one account – on more than one social media site. Are you aware of Google+ and Diaspora? Personally I need the Internet for most of my school projects and find a quick late night post seeking sympathy therapeutic. If he had been snickering about goofing off instead of working it would have been a different story. I absolutely agree with you and wish more parents did! Elaine Z brought up a great point. Yes, he COULD change his password… but I’d know it immediately when I couldn’t log onto his account. If he tried to get another account, he’d still want to be friends with the same people and I would find him when I checked out his friends. But mostly, I think my kids are learning the lesson that it is much, much easier to be honest and responsible than it is to lie and sneak around. I reward them with more privileges and increased responsibilities as they demonstrate the type of behavior that we are hoping to teach them. Well, mine are not old enough to have a FB account yet (they are 8 and 6) but I promise you this–I will do it the SAME way you are when they reach the age/maturity to have an account!! I think it’s WONDERFUL that you monitor your boys’ accounts like that! I also monitor my 16 yr old daughters FB account. And I am friends with her friends. There have been a few times we’ve had to rein in the time spent. With girls I think the biggest issue is the time they waste (ok, I’m guilty too) on FB. If I found out she was on FB and didn’t do a project….let’s just say, it would not be a pretty sight! With all the technology available to kids, you’ve got to monitor them 24/7. That, and pray. Well done. You are doing such a good job. I get really upset when I see young people posting personal information on the internet. It can be quite dangerous. My 15yo daughter was murdered a couple of years ago (nothing to do with FB at all). So you have to guide and protect your children as much as possible. MURDER is not something that happens to “someone else” It can happen to you too. I do not mean to alarm people, but you cannot be too careful where your children are concerned. I love your rules, they make perfect sense to me. 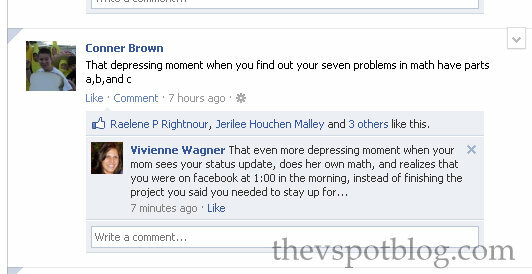 My girls are way to young to have fb, even though some of thier friends do (seriously at 6&7 come on how rediculous!) I definitely plan to use the same rules as you! Good for you! My kids grown but I didn’t allow them Facebook pages until they were 15/16 depending on the child, like you. I can’t stand seeing kids that are 10 having the pages and some of the pics I see that they have up. Facebook rules say you have to be 13, and parents obviously ignore this rule. Sad. Yes ma’am! You’re doing a great job–much better than we did. I’m grateful that my guys are pretty responsible when it comes to the use of their computers–not perfect, but pretty good. I wish I’d thought of that line, though–“The internet is written in ink, not in pencil”–scary thought, isn’t it? My kids aren’t aware of it yet, but I’m dreading the day they do. Thanks for the example you set. So.totally agree. I think it is also about their safety. Not.to be overly dramatic but a girl from Statan Island recently killed herself.in a very drastic manner. It wasn’t till After her death that her parents read her email, facebook, twitter and trxtrd to find out she was being tormented by bullies. I will always read. I will always monitor. I really agree with you.It really great blog.I really get information from your blog. Hallelujah and Heck YES! We have the same restrictions in our house and I stalk my kids (and kids’ friends) on a regular basis. The internet is a big scary place where content will follow them forever. Yes, parent AND protect is job #1. Not a mother, but I agree with your rules about FB for future kids. Ps voted for your dresser. It really is too cool for school. Yep, you are totally my kind of parent as you are just that a parent! You aren’t trying to be their best friend and let them walk all over you but are teaching them, monitoring them and making them live up to their mistakes. Definitely going to use your policies when my kids get ready for things like this. I was always the mean mom, in fact both girls said I was the most strict of all their friends. I held the philosophy that the more they disliked me, hated me the better mom I was. My now, 29 year old says, thank God I was that way cause otherwise they would have been in trouble. So hang in there…facebook is a very serious matter. I know people who did not get accepted to law schools, sororities, jobs because of stuff on their facebook account. One girl did not get a job teaching because of a picture with a SOLO cup in her hand…no proof of anything illicit. And it never goes away, even when you close out the account. So there are serious consequences who have nothing to do with your parenting. Good Luck and Hang in There Meanie! Congratulations! You’ve taken second place in the meanest Mom awards. I am pretty sure that I took first, we don’t allow Facebook, for anyone, even adults. My daughter is 20yrs old and doesn’t get to have privacy. She is friend’s with DAD! She happily lives under our roof and our rules. She told me she isn’t leaving until she gets married. That will be a while, because the boys ask her out and she says the first date is at home with her parents. They don’t stick around after that. She has learned to not let it hurt her, as she knows they had bad intentions, anyway. Some boy said something crude to her on FB, and DAD responded to it when she asked him to. The boy called the house and apologized, immediately…LOL! I love your policies and parenting. Our children will be the ones to bring good back into this chaotic world. Good Job! These are the exact policies I have with my son. Also, I have the right to delete any of his friends at anytime. And have done so twice. I informed him that I had, and why. He was okay with it, and he knows that I have access any time. However through my access, so far what I have discovered is that my son’s friends are all pretty good kids! But we are definitely known as the “strict parents” of the group. Oh, well, what can you do?? My dad reset my AIM password once (in the days before facebook!) he changed the password to “grounded” haha it only happened once. even now as a college student, i am Fb friends with my parents, my friends parents, the parents of the kids i babysit for, etc… it helps remind me to keep everything on there PC!